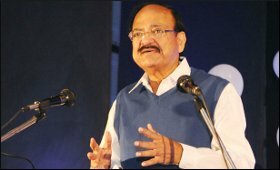 Vice President of M. Venkaiah Naidu Friday said that people must be at the centre of governance and the Leadership must have empathy and compassion. He said this while delivering the 24th Sree Chithira Thirunal Memorial Lecture in honour of Maharaja Sree Chithira Thirunal Balarama Verma, in Thiruvananthapuram, Kerala. The Governor of Kerala, Justice P. Sathasivam, the Minister for Culture and Law, Kerala, A.K. Balan and other dignitaries were present on the occasion. The Vice President said that a democratic government has to be ever vigilant, ever watchful, and ever open to new trends and they need to be responsive to the changing needs and times if they have to stay relevant. He further said that an attitude of constant reform, transformative visionary leadership can make a difference. The Vice President called Sree Chithira Thirunal an icon of good governance embodying the essence of ‘Indianness”. He further said that Sree Chithira Thirunal has shown the path that can propel India to greater development trajectory, to the heights of inclusive and sustainable development and well being. He further said that social justice and ‘inclusion’ were a part of the genesis of Independent India and we couldn’t have had a really ‘free’ nation with a sizable ‘unfree’ population. This concern is reflected in the Preamble of our Constitution which aims to secure social, economic and political justice to all our citizens, he added.